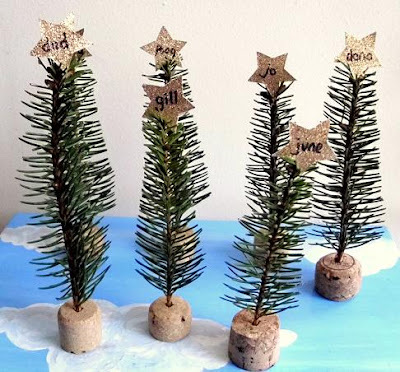 I was again looking for place markers that would be festive and having done trees before in 2008 that were made of paper...i decided this time to go for the real thing! 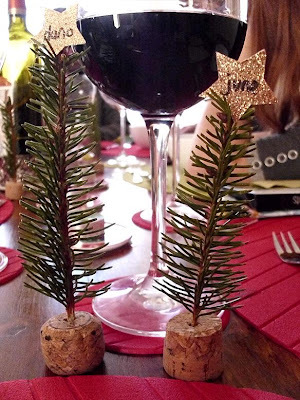 These were "harvested" (read: "pinched") from a tree in the centre of our village and poked into corks. I gave the needles a little trim around the top so that they had a more tree-like shape and would look less like bottle brushes. Little stars with names were added and they were planted on the table at each setting.